MAMA MIA! the Movie. Nowadays we seldom go to cinema to watch movies, however, this MAMA MIA movie is in town, so last night (28/10/08) we went to Star Cineplex to watch the movie, actually we had watched a LIVE PERFORMANCE in Melbourne 3 years ago on our 25th Wedding Anniversary (a gift from our children)... After we watched the movie, we both agree that the live show is much better than the movie, anyway we enjoyed lots of ABBA songs...One funny thing about the Star Cineplex is the pricing of the tickets - Male audience pays RM2 more than Female audience :) Adult-M $8, Adult-F $6. 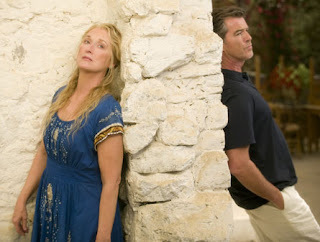 Meryl Streep leads an all-star cast as an independent, single mother who owns a small hotel on an idyllic Greek island. Donna (Streep) is about to let go of Sophie (Amanda Seyfried), the daughter she's raised alone. On a quest to find her father to walk her down the aisle, Sophie brings back three men from Donna's past to the Mediterranean paradise they visited 20 years earlier. Based on the smash hit musical seen by over 30 million people worldwide with a gross to date of US$2 billion. It is set to songs by popular '70s group ABBA. Temptation alone is not sin, knowing the temptation is bad and overcoming the temptation is definitely not sin, it could even bring merits as we cling to the good side. Judas was tempted, for 30 pieces of coins he betrayed Jesus, he fell for the temptation, sin is for sure... whether he repented is another academic question. Peter was tempted and denied Jesus 3 times to save his own skin, sin of course, but he confessed to Jesus (after Jesus rose from the death) and was forgiven. Sin is a deliberate act against God. Temptation alone is not sin. But if we let temptations lead us into action that is contrary to Church's teaching and displeases God, sin is for sure. Cindy, I hope you understand. My friend Jacob is clever! He says to make money we must serve the rich, and help the poor! If we help the rich to make 10 millions, rightfully we should benefit by earning 1 million, or so. While at the same time we should help the poor to become rich, so that when they are rich, we can serve them too. I tend to agree with him! This is a historic moment for Malaysia. Yesterday (5/8/08) was not a good day for my Nokia N70 mobile phone, it was struck dead by some Virus sent through blue-tooth... I should have been thinking correctly, but then, I was not thinking correctly, and my phone was dead! Sorry will be out of contact for a few days. Finally, i managed to upload some photos onto Picasa Web Albums. Youth Gathering photos and other photos are there. Actually this Picasa is kinda like a magic, it reveals all the photos in your computer, some of them you have long forgotten and some you never knew they were there! Last night (Saturday 3/8/08) we went to the 17th Mile Siburan Community Hall for the 40th Anniversary 1968-2008 St Ann's Ruby Jubilee dinner, as usual big gathering of 160 tables, as usual we invited guests for the dinner, this year we have Uncle V and family and aunty, plus Uncle Harry and Joseph Wong as our guests. the program was packed with entertainment, singing, dancing etc. Fr Augustine Jepy came over and asked Moses for the 10 Commandments !... As usual the sound was deafeningly loud, and knowing that the drinks are rationed, we bring our own drinks and pea nuts to enjoy the gathering, haha. Our company implements a new working hours since 1 July 2008: Alternate Saturday Off. Now we work from 8am to 5.30pm Monday to Friday with 1st, 3rd and 5th Saturday off. My dear and I are not used to the fullday together on Saturday - it felt like Sunday ! So when the actual Sunday arrives, it is like a Double Sunday!! Today is Faith Teng’s 15th Birthday! Finally we started off the praise and singing (with actions) at 8.30pm, with Faith and Reuben playing the Guitar. Reuben has to borrow my strap as he wanted to stand and play while Faith plays seated. After the singing, we listened to today’s Gospel, read 2 times by Uncle V and again by Aunty Faith… followed by mediation (Lectio Divina). what did the chicak on the wall say to the one that fell down? it fell to the ground when the thunder sounded, why? Now it is time to celebrate Birthday. Haiya not your birthdaylah, it’s Faith Teng’s birthday! 1 big 6big 5 small candlesaylah, it'ndles.Harry) knowing the rest of us, so each of the children introduced themselves in the same way small candles, more than enough. Faith I hope you will always remember your 15th Birthday! The Youth Ministry of St Peter’s Parish was formed with about 15 youths ! And of course the youthful happy Aunty Faith….